We've all been there, stuck in traffic, inching our way past the scene of a car crash. Damaged vehicles are sprawled out at odd angles. Broken glass, rear view mirrors, deflated tires, and other debris litter the roadway. Emergency responders and police officers are slowly walking through the wreckage. Why can't they just push all this stuff to the side and let me pass, you wonder. For law enforcement working the scene, there is a tricky balancing act at play. They want to clear the road as quickly as possible. Every minute a crash stays put adds pollution, traffic, and an increased risk of secondary accidents. It all adds up to lost productivity and, for the police working the roads, injuries and lost lives. But before the cleanup can really get underway, investigators have to capture a clear picture of the scene, because the cars and debris scattered across the road may very well be evidence in a criminal invesitgation. Over the last two years, a new technology has had an even more radical impact on the work of crash site reconstruction: drones. By adding airborn cameras to their toolkits, police have been able to cut the time it takes to map a site and gather evidence down to 20 or 30 minutes. What's more, the data they are gathering is better than what they were able to collect with previous methods that took hours. Police departments across the US have been rapidly adopting drone technology, and new research from Purdue University shows how effective these flying cameras can be when it comes to clearing roads after a car crash. That's great news for commuters who might otherwise be stuck in traffic. And for the first responders who work these scenes, it can be the difference between life and death. 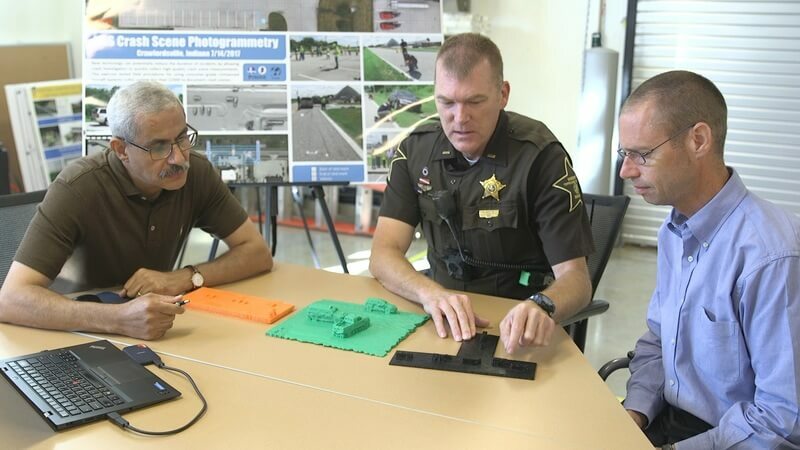 "The likelihood of a secondary crash increases by 3% for every minute the primary incident is ongoing, said Andrew Klane, a veteran of the Massachusetts State Troopers and a pioneer in the use of drones for crash scene reconstruction. "Traffic crashes and struck-by-incidents continue to be one of the leading causes of on-duty injuries and deaths for law enforcement, firefighters, and towing and recovery personnel." "Every four minutes of (road) closure you get mile backlog of traffic," said Capt. Robert Hainje of the Tippecanoe County Sheriff's Office in Indiana. "When we have queued traffic on the interstate, we increase the rate of crashes by approximately a factor of 24," says Darcy Bullock, a professor of civil engineering at Purdue University who collaborated with police on the use of drones for crash scene reconstruction. "The next step is scaling this,” says Prof. Bullock. “To move beyond two to three agencies in the area doing this routinely to a more scalable statewide deployment that is used by all first responders and the state police." Police departments in Oregon, Massachusetts, and several others states have begun using drones for crash scene reconstruction. "It’s better, and it takes less time, and that’s very interesting to me, because usually something has to give," says Klane. He used to be annoyed when people would ask him if his job was anything like what they saw on TV. "You watch CSI and they solve the car crash in about 12 seconds. I used to laugh,” said Klane. With the advent of drone technology, however, that fantasy is getting closer to reality. "We’re getting there. It’s starting to happen."